Justus F. Holcombe was born on 11 May 1837 at LeRoy, Bradford Co., PA. He was the son of Marlin Holcombe and Electa Bailey. Justus F. Holcombe died on 3 September 1839 at age 2. Apparently the Walace listed in the 1850 census of LeRoy, Bradford Co., PA, age 10, in the household of his sister, Fidelia and her husband, Malvin Wooster. He served in the Army. J. Wallace Holcombe was born in January 1840 at LeRoy, Bradford Co., PA. He was the son of Marlin Holcombe and Electa Bailey. Mahlon was recorded in the 1850 census of LeRoy, Bradford Co., PA, age 8, in the household of his parents, Martin and Electa. Mahlon was recorded in the 1870 census of Leroy, Bradford Co., Pa., as a farmer. Mahlon was recorded in the 1880 census of LeRoy, as a farmer age 39, with wife Mary, mother Electa, brother Albert and son Clinton. They lived in Bradford until Oct. 5, 1886 when they started to Elma, Washington Ter., where they arrived Oct. 14, 1886. Mahlon A. Holcombe was born on 19 March 1842 at LeRoy, Bradford Co., PA. He was the son of Marlin Holcombe and Electa Bailey. Mahlon A. Holcombe married Mary M. Boothe on 3 January 1866. Mary M. Boothe was born on 22 November 1845. She married Mahlon A. Holcombe, son of Marlin Holcombe and Electa Bailey, on 3 January 1866. Laura was recorded in the 1850 census of LeRoy, Bradford Co., PA, age 1, in the household of her parents, Martin and Electa. Laura Ann Holcombe was born on 7 November 1845 at LeRoy, Bradford Co., PA. She was the daughter of Marlin Holcombe and Electa Bailey. Laura Ann Holcombe died on 7 August 1856 at age 10. Emmett followed the General Merchandise business from his boyhood, working in his father's store until taking up the business with his son; an active member in the Church of Christ, at Leroy since his youth, one of the Elders. Emmett was recorded in the 1880 census of LeRoy, Bradford Co., PA, age 24, married living in the household of his parents, Hugh and Martha. Emett and Jennie were enumerated in the 1900 LeRoy, Bradford Co., PA, federal census. He was a farmer, age 44; she was 39. The only child in the household was Ernest, age 18. Emmett and Jennie were enumerated in the 1910 LeRoy, Bradford Co., PA, federal census. He was a merchant age 55, she was 49. There were no children in the household. The census indicated that they had had only one child, and he was still living. [S23] Jesse Seaver, The Holcomb(e) Genealogy, Page 82/Item 241.1.IV.i. [S25] Hannah McPherson, Holcombe Genealogy, Page 141.1/Item A-8-1-2-13-4-1-4-1. [S414] Hon. Horace L. Moore, Andrew Moore, Page 29. [S414] Hon. Horace L. Moore, Andrew Moore, Page 14. Elizabeth Holcombe was born on 14 October 1784. She was the daughter of Phinehas Holcombe and Elizabeth Gibbs Moore. Elizabeth Holcombe married James D. Thorp in 1805. Elizabeth Holcombe died on 23 September 1860 at age 75. She was buried at Town Hill Cemetery, New Hartford, Litchfield Co., CT.
[S25] Hannah McPherson, Holcombe Genealogy, Page 124.1/Item A-8-1-2-6-4-2. Susan Holcombe was born in November 1790. She was the daughter of Phinehas Holcombe and Elizabeth Gibbs Moore. Susan Holcombe married Addison Thorp in 1820. Susan Holcombe died on 23 August 1862 at age 71. 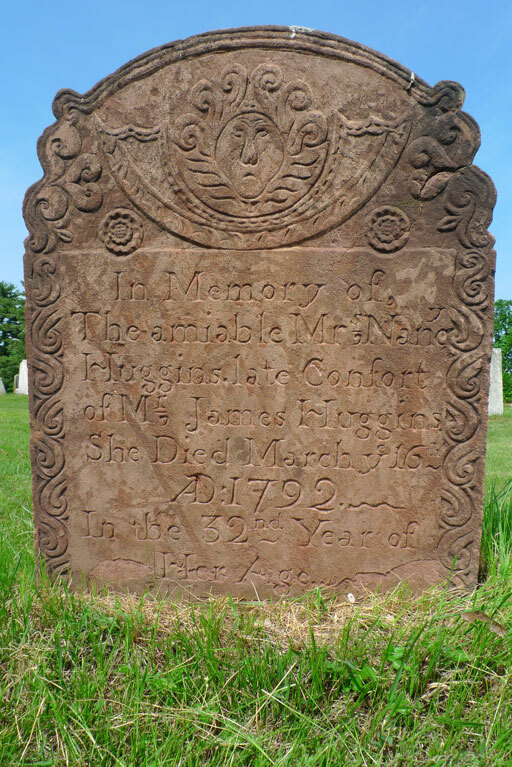 She was buried at Town Hill Cemetery, New Hartford, Litchfield Co., CT.
[S75] Holcombe. Seth P., Phineas Holcomb, Page 4/Item 4. [S25] Hannah McPherson, Holcombe Genealogy, Page 124.1/Item A-8-1-2-6-4-3. "Schuyler was a private in the War of 1812; served in New London, CT under Moses Hayden, Commander, from August 3, 1813 to September 16, 1813; Huldah was living in 1878, age 75 in the Nepaug section of New Hartford." Schuyler Holcombe was born on 27 January 1793. He was the son of Phinehas Holcombe and Elizabeth Gibbs Moore. Schuyler Holcombe married Huldah Crow, daughter of Schubael Crow and Huldah Adams, on 9 December 1813 at New Hartford, Litchfield Co., CT. Schuyler Holcombe died on 13 September 1819 at age 26. [S75] Holcombe. Seth P., Phineas Holcomb, Page 5/Item 5. [S25] Hannah McPherson, Holcombe Genealogy, Page 124.2/Item A-8-1-2-6-4-4. [S776] Barbara Jean Matthews, "Children of Keziah Judd." Julia Holcombe was born on 31 July 1794. She was the daughter of Phinehas Holcombe and Elizabeth Gibbs Moore. Julia Holcombe married Deacon James Merrill, son of Phinehas Merrill and Anna Buel, on 23 September 1811 at New Hartford, Litchfield Co., CT.
[S75] Holcombe. Seth P., Phineas Holcomb, Page 7/Item 6. [S104] DAR DAR Lineage book, Vol. LV:Pg. 72/Item 54176. [S25] Hannah McPherson, Holcombe Genealogy, Page 124.2/Item A-8-1-2-6-4-5. Harriet Holcombe was born in January 1796. She was the daughter of Phinehas Holcombe and Elizabeth Gibbs Moore. Harriet Holcombe married Shubel Crow, son of Roger Crow and Anna (?). Harriet Holcombe died on 25 January 1865. [S25] Hannah McPherson, Holcombe Genealogy, Page 124.2/Item A-8-1-2-6-4-6. [S75] Holcombe. Seth P., Phineas Holcomb, Page 9/Item 7. Friend Holcombe was born on 27 August 1799 at New Hartford, Litchfield Co., CT. He was the son of Phinehas Holcombe and Elizabeth Gibbs Moore. Friend Holcombe married Lydia Roberts, daughter of John Roberts, on 22 March 1821 at New Hartford, Litchfield Co., CT. Friend Holcombe married Susan Serepta Beach, daughter of Caleb Beach and Sarah Blakeslee, on 18 July 1837. Friend Holcombe died on 20 April 1850 at New Hartford, Litchfield Co., CT, at age 50. He was buried at Village Cemetery, New Hartford, Litchfield Co., CT.
Widow Susan was enumerated in the 1850 New Hartford, Litchfield Co., CT, federal census, taken 16 Oct 1850. She was 42. Children in the household were Henry 22, Caroline 19, Flidelia 18, Frederick 15, Robert 13, Harriet 12, Hubert 10, Clarissa 9, and James 3. [S104] DAR DAR Lineage book, Vol. LXXIX:Pg. 156/Item 78391. [S25] Hannah McPherson, Holcombe Genealogy, Page 124.2/Item A-8-1-2-6-4-7. [S75] Holcombe. Seth P., Phineas Holcomb, Page 14/Item 8. 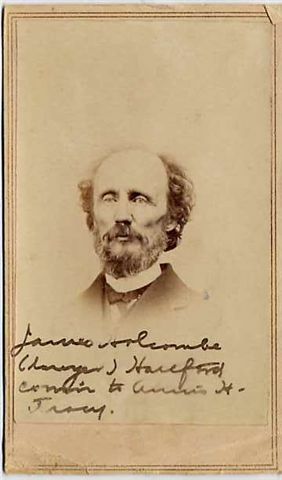 Harmon H. Holcombe was also known as Herman Holcombe.3 He was born on 27 October 1802 at New Hartford, Litchfield Co., CT. He was the son of Phinehas Holcombe and Elizabeth Gibbs Moore. Harmon H. Holcombe married Sophronia Avery on 27 November 1828 at New Hartford, Litchfield Co., CT.4 Harmon H. Holcombe witnessed the will of Phinehas Holcombe on 18 April 1829 at New Hartford, Litchfield Co., CT. Harmon H. Holcombe died on 14 September 1890 at New Hartford, Litchfield Co., CT, at age 87. He was buried on 16 September 1890 at Village Cemetery, New Hartford, Litchfield Co., CT.
Harmon built the house later known as "Hillcrest" opposite his father's dwelling and across the road; in exchange for life care of his father, Harmon inherited the family farm and later tore down the house where Phinehas lived; on that foundation in 1913 John M. Holcombe built the dwelling known as "Overledge". Harmon represented Windsor in the Connecticut Assembly in 1849; he was listed as a resident, 81 years old, in a compliation there in 1844. [S75] Holcombe. Seth P., Phineas Holcomb, Page 20/Item 9. [S25] Hannah McPherson, Holcombe Genealogy, Page 125.1/Item A-8-1-2-6-4-8. [S336] Ancestry.com, Connecticut Town Birth Records, pre-1870 (Barbour Collection). Mr. Douglass Williams died very suddenly Tuesday afternoon. He was out riding during the day and had been on the street that afternoon feeling quite well. He went home and sat down, complaining of feeling badly and died almost immediately. Mr. Williams was a man much respected in this community and his sudden death was a shock to all, although his ill health for some time past made it apparent that he could not live very long; but none expected the death angel would come so soon. He probably died of heart disease. The funeral will be Friday afternoon at 2 o'clock in the Baptist church. [S25] Hannah McPherson, Holcombe Genealogy, Page 125.1/Item A-8-1-2-6-4-9. [S242] Seth P. Holcombe, Douglass Williams, Page 3. [S242] Seth P. Holcombe, Douglass Williams. Children of Nancy Smith Huggins and Phinehas Holcombe Jr.
[S419] Carol Laun, Beneath These Stones, Page 130. Isaac Porter witnessed the marriage of Phinehas Holcombe Jr. and Nancy Smith Huggins on 21 October 1805 at Village of North Granby, Granby, Hartford Co., CT.
James Huggins married Nancy Smith. Nancy Smith was born circa 1760. She married James Huggins. Nancy Smith died on 16 March 1792. James D. Thorp was buried at Town Hill Cemetery, New Hartford, Litchfield Co., CT. James was a deacon in the Town Hill Congregational Church. He was born on 17 April 1794. He married Elizabeth Holcombe, daughter of Phinehas Holcombe and Elizabeth Gibbs Moore, in 1805. James D. Thorp died on 23 November 1850 at age 56. James Huggins Holcomb was baptized in the Town Hill Congregational Church, New Hartford, Connecticut in June of 1807; by letter of transmittal he joined Center Church, Hartford in February of 1834. In 1822 his name is inscribed as a pupil in Dr. Cooley's School in Granville, Massachusetts, where he boarded with Mr. Haines, who reported to the former's mother that the young pupil studied hard and was a good scholar. James Huggins Holcomb was one of the first members of the Hartford County Bar Association and began the practice of law in Hartford in 1834. One of the very early members of the Republican Party, he was Clerk of the Superior Court from 1838 to 1842, Clerk of the House in 1845 and of the Senate in 1847. In 1840 James Huggins Holcomb purchased the land and dwelling at 79 Spring Street, Hartford, which in the next 110 years was to be occupied by six generations of Holcombes. In March of 1873, he, his wife, their son James and daughter "Kitty" (Sarah) left for Europe, intending a trip of "a couple of years"; however, Kitty died in February 1874; James Huggins Holcomb died in 1889 and James Winthrop died in 1910; after that Emily Merrill (Johnson) Holcomb returned to Hartford, where she lived at the Highland Court Hotel on Windsor Avenue, about opposite Belden Street. James and Emily were enumerated in the 1850 Hartford, Hartford Co., CT, federal census. He was an attorney, age 43, she was 25. Children in the household were James W. 4, and John M. 2. Also in the houeshold was his mother, Nancy 66. James and Emily were enumerated in the 1870 Hartford, Hartford Co., CT, federal census, 2nd Ward, page 143. He was a lawyer age 62, she was 45. Children in the household were James W. 24, John M. 22, and Kate 7. Mr. James H. Holcombe, for many years a resident of Hartford, died after a brief illness, on the 18th of last month, at Positano, Italy, where he has been living for a year or more. Mr. Holcombe was born in Granby, in this state in 1806, and was in his 84th year, being one of the oldest members, if not the oldest, of the Hartford bar. He began the practice of law here in 1834, and his first law partner was the Hon. James Dixon. Afterward he was with James O. Walkley and Judge Z. A. Storrs. He was clerk of the superior court from 1838 to 1843, when he was succeeded by Thomas H. Seymour. Mr. Holcombe was clerk of the house in 1845, and of the seenate in 1847. He was never of vigorous health, and his strength failing, he went abroad, with his wife and daughter and one son, in 1878 and has lived there ever since, returning only once to Hartford in that period. His daughter died the first year of their absence. His home has been most of the time in the even climate of Italy, for several years in Capri, though he also traveled a good deal; and Positano, where he died, was chosen because of its general healthfulness. Mrs. Holcombe, who was a daughter of General Nthan Johnson and sister of Mr. Charles W. Johnson, survives him, as do both of his sons, Mr. James W. Holcombe, who graduated at Yale in 1868, and Mr. John M. Holcombe, Yale '69, the vice-president of the Phoenix Mutual Life Insurance Company. Mrs. Holcombe and Mr. James W. Holcombe will probbly return to Hartford in the spring. [S75] Holcombe. Seth P., Phineas Holcomb, Page 22/Item 11. [S76] Seth P. Holcomb, The Descendants of James Huggins (1752-1819) of Granby, Connecticut, Page 16/Item 9. [S25] Hannah McPherson, Holcombe Genealogy, Page 123.2/Item A-8-1-2-6-4-1-1. [S818] Edwin W. Strickland II, William Buel, 8-14, page 419. Nancy Smith Holcombe was born on 11 April 1809 at probably New Hartford, CT. She was the daughter of Phinehas Holcombe Jr. and Nancy Smith Huggins. Nancy Smith Holcombe married Harvey Bates Elmore, son of Dr. Nathaniel Elmore and Lucy Harvey, in 1831. Nancy Smith Holcombe died on 23 October 1846 at Chicago, IL, at age 37. [S75] Holcombe. Seth P., Phineas Holcomb, Page 23/Item 23. Monemia Juliette Thorp was born on 15 July 1806 at New Hartford, Litchfield Co., CT. She was the daughter of James D. Thorp and Elizabeth Holcombe. Monemia Juliette Thorp married Horace Goodwin, son of Ebenezer Goodwin and Ruth Goodwin, on 16 January 1838. Monemia Juliette Thorp died on 10 August 1873 at age 67. Horace was a farmer in New Hartford. Horace Goodwin was born on 16 July 1803 at New Hartford, Litchfield Co., CT. He was the son of Ebenezer Goodwin and Ruth Goodwin. Horace Goodwin married Monemia Juliette Thorp, daughter of James D. Thorp and Elizabeth Holcombe, on 16 January 1838. [S267] James Junius Goodwin, Goodwins, Page 229, Item 210. [S267] James Junius Goodwin, Goodwins, Pagae 228, Item 208. [S267] James Junius Goodwin, Goodwins, Page 228. Ruth Goodwin was born on 14 May 1769.1 She was the daughter of Jonathan Goodwin and Esther Benham. Ruth Goodwin married Ebenezer Goodwin, son of Ebenezer Goodwin and Ame Webster. [S267] James Junius Goodwin, Goodwins, Page 503. [S267] James Junius Goodwin, Goodwins, Page 503, Item 801. [S267] James Junius Goodwin, Goodwins, Pagae 502. Esther Benham was born on 4 March 1737 at Wallingford, New Haven Co., CT.1 She married Jonathan Goodwin, son of Eleazer Goodwin and Hannah Easton, on 10 May 1758. Esther Benham died on 20 June 1811 at age 74. Elizabeth Juliette Goodwin was born on 28 October 1838. She was the daughter of Horace Goodwin and Monemia Juliette Thorp. Elizabeth Juliette Goodwin lived in 1890 at New Hartford, Litchfield Co., CT.
Ellen Frances Goodwin was born on 16 March 1840. She was the daughter of Horace Goodwin and Monemia Juliette Thorp. Ellen Frances Goodwin lived in 1890 at New Hartford, Litchfield Co., CT.
Elizabeth Thorp was buried at Town Hill Cemetery, New Hartford, Litchfield Co., CT. She was born on 7 February 1827. She was the daughter of James D. Thorp and Elizabeth Holcombe. Elizabeth Thorp died on 28 November 1834 at age 7.1 She died on 21 December 1834 at age 7. [S216] Unknown subject unknown repository. Addison Thorp was born on 24 January 1791. He married Susan Holcombe, daughter of Phinehas Holcombe and Elizabeth Gibbs Moore, in 1820. Addison Thorp died on 18 February 1860 at age 69. He was buried at Town Hill Cemetery, New Hartford, Litchfield Co., CT.
William Thorpe died Monday 14th, he was the son of Addison Thorp and his wife Susan, the sister of Herman (should read Harmon. SPH) Holcomb, Sr. of West Hill. Mr. Thorpe has been out of health for the past three years, though he was confined to the bed but a few days before his death. He has lived in the family of J. Henry Merrill and his mother for over 24 years and it was there, in the old Roswell Marsh place, that he died. He leaves a little property and a considerable collection of Indian relics. He was never married. He was buried Monday at 2 o'clock on Town Hill by the side of his father and mother. The auction sale of the effects of the late William Thorp, at the house of Miss Catherine Merrill on West Hill, drew out quite a large and interesting crowd of bidders. The Indian relics, consisting of arrow and spear heads, tomahawks, pistols etc. were an interesting feature and their possession was hotly contested for by different bidders. William Thorp was born on 21 July 1821. He was the son of Addison Thorp and Susan Holcombe. William Thorp died on 14 August 1887 at Dysentry; Old Roswell Marsh Place, New Hartford, Litchfield Co., CT, at age 66. [S75] Holcombe. Seth P., Phineas Holcomb, Page 4. Huldah Crow was born on 27 January 1793 at New Hartford, Litchfield Co., CT. She was the daughter of Schubael Crow and Huldah Adams. Huldah Crow married Schuyler Holcombe, son of Phinehas Holcombe and Elizabeth Gibbs Moore, on 9 December 1813 at New Hartford, Litchfield Co., CT. Huldah Crow died on 12 December 1880 at New Hartford, Litchfield Co., CT, at age 87. She was buried at Town Hill Cemetery, New Hartford, Litchfield Co., CT.
Charles Nelson Holcombe was born on 27 February 1815. He was the son of Schuyler Holcombe and Huldah Crow. Charles Nelson Holcombe was baptized on 18 September 1831 at Town Hill Church, New Hartford, Litchfield Co., CT. He married Mary Byrne on 1 February 1837. Charles Nelson Holcombe died on 14 September 1849 at New Haven, CT, at age 34. [S25] Hannah McPherson, Holcombe Genealogy, Page 124.2/Item A-8-1-2-6-4-4-1. They lived on the present Bruning Road, New Hartford; from Elizabeth's obituary we find that they had two children both of whom died early in childhood; however, his obituary reports they had only one son. Elizabeth A. Holcombe was born on 18 April 1817 at New Hartford, Litchfield Co., CT. She was the daughter of Schuyler Holcombe and Huldah Crow. Elizabeth A. Holcombe married Frederick Merrill, son of Capt. Norman Merrill and Anna Marsh, on 18 April 1838 at New Hartford, Litchfield Co., CT. Elizabeth A. Holcombe died on 19 January 1885 at New Hartford, Litchfield Co., CT, at age 67. She was buried on 22 January 1885 at Nepaug Cemetery, New Hartford, Litchfield Co., CT.
Frederick Merrill was born on 21 January 1813 at New Hartford, Litchfield Co., CT. He was the son of Capt. Norman Merrill and Anna Marsh. Frederick Merrill married Elizabeth A. Holcombe, daughter of Schuyler Holcombe and Huldah Crow, on 18 April 1838 at New Hartford, Litchfield Co., CT. Frederick Merrill died on 15 April 1901 at New Hartford, Litchfield Co., CT, at age 88. He was buried on 17 April 1901 at Nepaug Cemetery, New Hartford, Litchfield Co., CT.